The town of Norrköping lies at the outflow of the Motalaström into the Bråvik, an inlet on the Baltic which extends inland for some 50km/30mi. The Bråvik forms a natural boundary between the wooded region of Kolmård to the north and the fertile arable country of Vikboland to the south ... More Norrköping is a busy industrial town (metalworking, textiles) and an important port. Arbetets museum (The museum of work) free entrance, is worth a visit, as is the surrounding Industrilandskapet/Strykjärnet area with a concert hall, a science park, a tourist center, a church, other museums, an art school, some space owned by the university and a lovely waterfall. Norrköpings konstmuseum (Norrköping's art museum) (Kristinaplatsen) has a large collection of 20th century modern art as well as contemporary works. Free entrance. The cactus display in Karl Johans park (close to the railway station) has over 25,000 cacti. 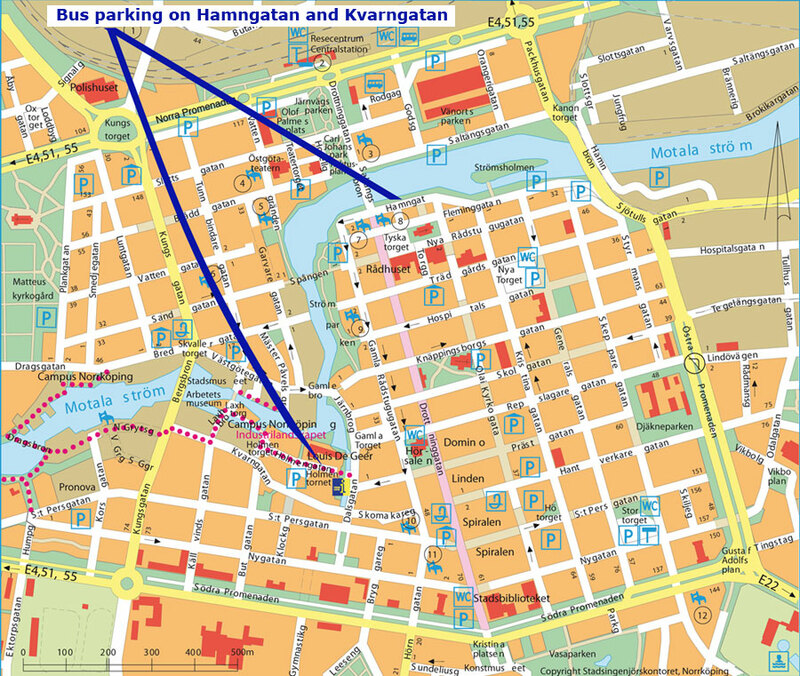 A nice way to get around in Norrköping is with the yellow trams. Tickets or cards can be bought onboard but the price is twice as high compared to if you buy the ticket or card beforehand in a kiosk, supermarket or similar. You can even pay by SMS to avoid the 50% surcharge when paying cash on the tram or bus. There are lots of shops on the main street Drottninggatan and nearby streets. Especially interesting are the shopping malls Linden, Domino and Spiralen at Drottninggatan. "Nyårsdagen", New Year's Day (january 1:st). "Trettondedag jul", Epiphany (January 6:th). "Kristi Himmelsfärdsdag", Ascension Day (39:th day after Easter).